In the wireless world, faster is always better. But there are a few key concepts to keep in mind – bands, standards, bandwidth and range. Bands: You will be seeing a lot of “dual band” devices. 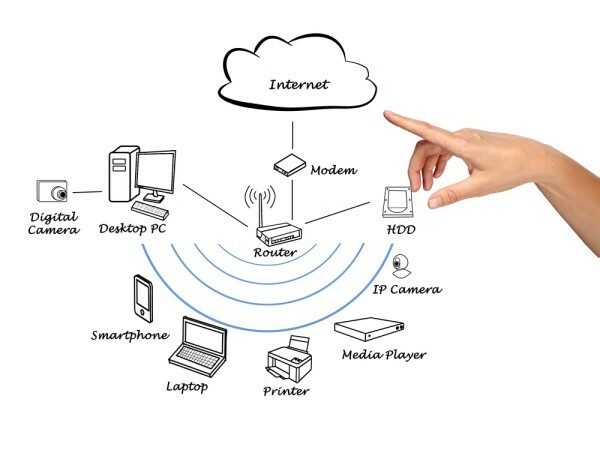 This means that the wireless signal operates in two different bands – 2.4 GHz and 5 GHz. You can segment your wireless traffic on the two bands. For instance, you can put your video streaming devices on one band and your web browsing on a different band to maximize performance. 2.4 GHz – this is the traditional WiFi band. It offers decent range and excellent interoperability between devices. One issue, however, is that 2.4 GHz radio waves are absorbed by water–containing vessels such as the human body. 5 GHz – a newer, standardized band with obviously higher frequency. Keep in mind that the higher the frequency, the bigger the bandwidth but the shorter the range. Think of this has having more “waves per second” than the 2.4 GHz band. The more waves per second that arrive, the more data per second that can travel with them. Communication Standards – Now let’s talk about standards, generally labeled with an 802.11 prefix such as 802.11g or 802.11n. These standards determine how and at what speeds devices will communicate with each other. The next emerging standard in this space is 802.11ac. You will hearing a lot about it in the months to come and the first products capability of communicating at top speeds via this standard are available today. That takes us to the new Linksys router, the EA6500. This router supports both dual-band operation but also can communicate via the emerging standard 802.11ac for top performance. But more importantly, the new Linksys approach to managing a router is what makes this unique. Known as Linksys Smart WiFi, the new user interface to the browser is a significant step-up for the home user. If you have ever tried to change the settings on your router, you soon realize that the router is easy to use by only one individual – the designer of the router itself. Difficult to navigate and saddled with poor documentation, managing a router can be a challenge. The Linksys Smart WiFi approach is refreshingly different. First off, the router’s home page can be customized by adding or subtracting “widgets” on the EA6500’s home page. If setting and maintaining Parental Controls is critical for you, then move that function to the home page for easy access. Second is the ease of prioritizing the priority of traffic going out over your Internet connection. In other words, what programs or devices should be in the fast lane for performance. Here again, the EA6500 excels by allowing you to prioritize by device, application or specific online game. In earlier routers, this prioritization (known as Quality of Service or QoS) was incredibly tough to set-up. The user interface on the EA6500 makes customizing your QoS a simple drag-and-drop exercise. Finding your router is also significantly easier. The EA6500 include Bonjour networking so that navigating to the router’s home page is trivial if you have Bonjour turned on in your browser. Linksys also also made available a number of smartphone apps to help you manage network device connections and parental controls . I have one minor complaint, however. My router’s home page looks different in Safari vs. Firefox. Some of the widgets do not render the same way in all of the browsers and this can lead to navigation confusion. Hopefully, Linksys will fix this in an upcoming firmware release. We also need to talk about performance. My new router handles big time network traffic with ease. I’ve got it set up to give priority to my streaming videos services on my Roku and my AppleTV. Finally, I’m waiting to use the spiffy new 802.11AC capability for a lightning fast wireless experience. Unfortunately, none of my older end-user devices such as laptops and iPads currently support this emerging standard. So patiently I will sit, ready to pounce on a faster WiFi as soon as it becomes prevalent.